This time of year the end of the winter CSA isn’t too exciting. 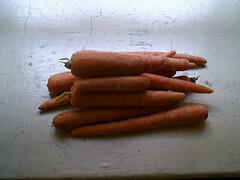 I’m getting a lot of carrots and potatoes and some apples. At this time of year apples are plentiful. Maybe you’ve been eating them plain and making apple pie but apples are also wonderful in a stew. (Plus I don’t like pie). Country Captain Stew is a recipe that I use when I have extra apples and potatoes. I never make it exactly like the recipe but use it as a base. I always include the tofu, apples, potatoes, and spices but everything else varies depending on what I have on hand. Plus, my CSA gave me the largest apples I’ve ever seen – they are huge! 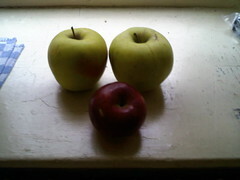 The picture above shows a normal sized apple next to the enormous ones that I used for the stew. Last week when I wrote about Broccoli Cheddar Soup, I threatened to make my Broccoli Cheddar Loaf even though I am the only one in my family who likes it. 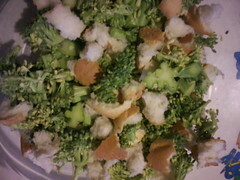 I still had so much leftover broccoli leftover that I decided to make it. I figured since Alex was at her Dad’s I could eat half of it and then freeze the rest of it. This recipe comes from Vegetarian Times, which I used to subscribe to.